The Weimaraner is courageous, alert, intelligent and protective. Weimaraners are always keen to work and full of energy. They are not suited for owners who don't have the time to regularly exercise them or keep them occupied. The Weimaraner is eager to please and quick to learn, but they do need a confident handler, as they can be somewhat dominant if given the chance. Weimaraners are friendly with children and get along with other dogs. They are not unfriendly towards strangers but will act as an impressive guard if their home or family is threatened. It is necessary to socialize them with other pets and animals during puppyhood in order for them to live harmoniously together. The smooth-haired variety only needs occasional grooming with a rubber brush to remove the loose hairs. The coat can be polished with a cloth to bring out the coat's shine. The long-haired type needs more regular grooming with a brush and comb. The ears also need to be checked regularly to ensure that they are clean. Weimaraners are good field sports dogs and having them involved in these sports is an excellent way to meet their exercise needs. They also enjoy swimming and retrieving and demand plenty of regular exercise. If this breed is getting adequate exercise then they will be calm when indoors. Weimaraners got their name from Weimar in Germany and are the oldest German pointing breed. They were developed by hunters to tackle both large and small game and are believed to have evolved from the German Short and Wire Haired Pointers and the old German Schweisshunde (a type of bloodhound). General Appearance: Racy, powerful and elegant. Color: Silver grey, roebuck or mouse-grey. A dark eel stripe on the back or a white chest is accepted. Coat: Short-haired variety - Short, sleek and close. Long-coated variety - Soft and 3-5cm (1.5-2 in) in length. Tail: Customarily docked and carried out or slightly up when active. Ears: Set high, long, lobular and folding slightly inwards. Body: The body is well-proportioned and muscular with well-laid back shoulders and long, well-sprung ribs. The topline is level and the back is of medium length. Weimaraners will happily live in a kennel outdoors, provided they receive enough attention and exercise. The long-haired variety is much rarer than the smooth-haired type. Weimaraners have been nicknamed the Grey Ghost with their silver-grey coloring, which the experts crave. 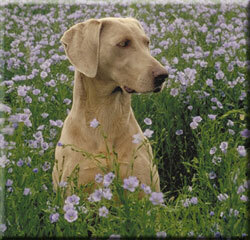 The eyes of Weimaraners are an outstanding feature as they can be either amber or blue in color.